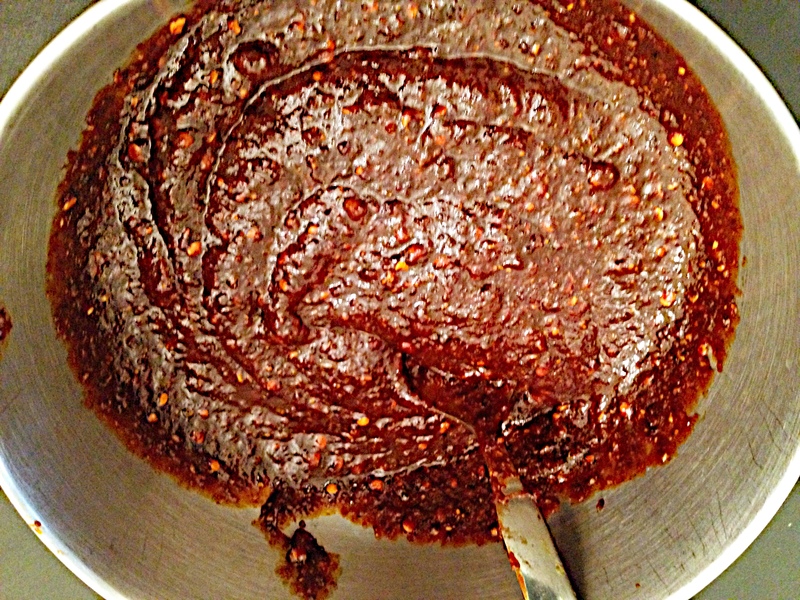 Chili Jaggery Chutney – One Half Indian. In February, when I had a glorious snow week (that’s right, a week, not a day), we spent a day in Raleigh playing in the snow with my nephew. We played down the street at a neighbor’s house who also served us a fabulous lunch. She served this chili jaggery chutney with the food, and my husband and I could not stop eating it. She told us the ingredients at the time, but we had not tried making it until now. It is so so so good. This chutney goes well with any food, not just Indian. It’s basically just an all purpose hot sauce with great flavor in my opinion. I think this chutney would be particularly delicious with anything Mexican. I plan to make some cheese quesadillas after school today and slather each piece with this chutney. Cannot wait. This was my first time making this, and I made up my own measurements. You may want less tamarind or more garlic or less jaggery. Just taste and adjust things as you go. 2. Spread chilies out on a baking sheet. Place them in the oven to further dry for about 20-30 mins. Remove from oven and discard the stems. 3. Bring the 1 1/2 cups of water to a simmer in a small saucepan with a lid. Remove from heat. Break the dried tamarind into pieces and add it to the hot water. Place the lid on the tamarind and water and leave for 20 mins. 4. After 20 mins of soaking and when the tamarind is cool enough to touch, place hands in the tamarind pot and squish the tamarind to further break the pulp from the seeds and fibrous materials. 5. Place a colander in a bowl. (NOTE: I used a large strainer with big holes, like I would use for spaghetti. We tried a mesh one, but the holes were too small.) Put tamarind mixture into the colander. Using your hand, press the tamarind pulp through the colander. Get as much pulp out as you can. Discard the leftover seeds and fibrous material that did not go through the colander. 6. Place 3 tbsp of water in a saucepan with jaggery. Heat over medium heat for 5-10 minutes or until jaggery begins to soften and break. The jaggery just needs to soften, it does not need to be complete liquid. 7. 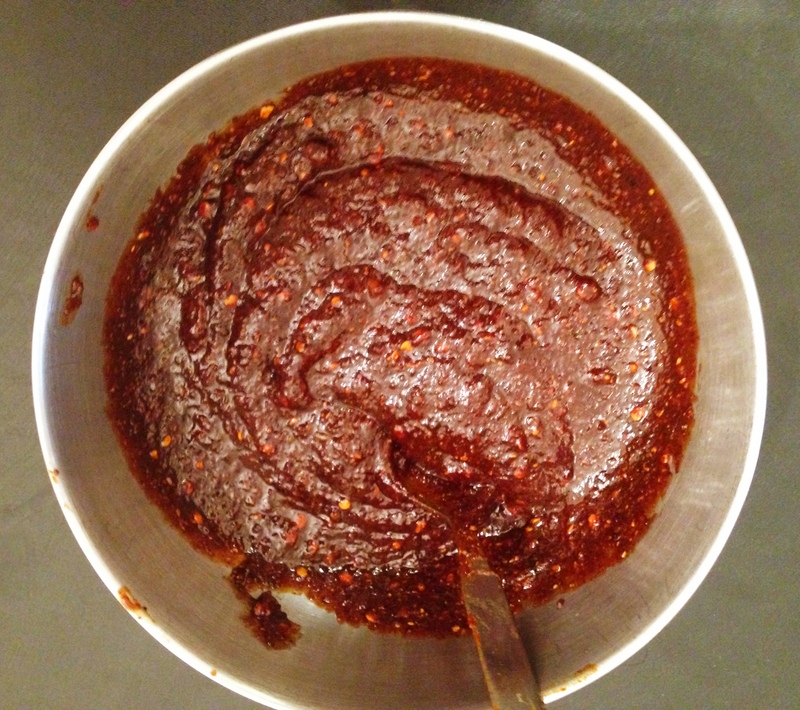 Place peppers, garlic, tamarind pulp, jaggery + liquid, and salt in a blender. Work in batches if necessary. Blend until smooth. The chutney should be thick, but if it is too thick, add a tsp of water more at a time to thin. You don’t want it to be too watery. Pingback: Pad Thai | One Half Indian.